Members of this family adopt a structure consisting of several large open beta-sheets. Their exact function has not, as yet, been determined [(PUBMED:12135361)]. Vitellinogen precursors provide the major egg yolk proteins that are a source of nutrients during early development of oviparous vertebrates and invertebrates. Vitellinogen precursors are multi-domain apolipoproteins that are cleaved into distinct yolk proteins. Different vitellinogen precursors exist, which are composed of variable combinations of yolk protein components; however, the cleavage sites are conserved [(PUBMED:17314313), (PUBMED:9692232)]. 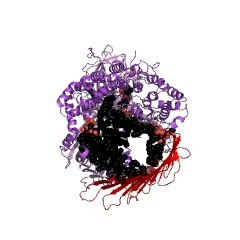 In vertebrates, a complete vitellinogen is composed of an N-terminal signal peptide for export, followed by four regions that can be cleaved into yolk proteins: lipovitellin-1, phosvitin, lipovitellin-2, and a von Willebrand factor type D domain (YGP40). Vitellinogens are post-translationally glycosylated and phosphorylated in the endoplasmic reticulum and Golgi complex of hepatocytes, before being secreted into the circulatory system to be taken up by oocytes. In the ovary, vitellinogens bind to specific Vtgr receptors on oocyte membranes to become internalised by endocytosis, where they are cleaved into yolk proteins by cathepsin D. YGP40 is released into the yolk plasma before or during compartmentation of lipovitellin-phosvitin complex into the yolk granule. The different yolk proteins have distinct roles. Phosvitins are important in sequestering calcium, iron and other cations for the developing embryo. Phosvitins are one of the most phosphorylated (10%) proteins in nature, the high concentration of phosphate groups providing efficient metal-binding sites in clusters [(PUBMED:17189915), (PUBMED:8838584)]. Lipovitellins are involved in lipid and metal storage, and contain a heterogeneous mixture of about 16% (w/w) noncovalently bound lipid, most being phospholipid. Lipovitellin-1 contains two chains, LV1N and LV1C [(PUBMED:12135361), (PUBMED:9687371)]. This entry represents the beta-sheet shell domain found in vitellinogen, which generally corresponds to the lipovitellin-2 peptide product. This domain consists of several large open beta-sheets [(PUBMED:12135361)]. It is often found C-terminal to IPR001747 and IPR015255. There are 546 DUF1944 domains in 539 proteins in SMART's nrdb database. Taxonomic distribution of proteins containing DUF1944 domain. This tree includes only several representative species. The complete taxonomic breakdown of all proteins with DUF1944 domain is also avaliable. Click on the protein counts, or double click on taxonomic names to display all proteins containing DUF1944 domain in the selected taxonomic class. The refined molecular structure of lipovitellin is described using synchrotroncryocrystallographic data to 1.9 A resolution. Lipovitellin is the predominantlipoprotein found in the yolk of egg-laying animals and is involved in lipid and metal storage. It is thought to be related in amino acid sequence to segments of apolipoprotein B and the microsomal transfer protein responsible for the assemblyof low-density lipoproteins. Lipovitellin contains a heterogeneous mixture ofabout 16% (w/w) noncovalently bound lipid, mostly phospholipid. Previous X-raystructural studies at ambient temperature described several different proteindomains including a large cavity in each subunit of the dimeric protein. Thecavity was free of any visible electron density for lipid molecules at roomtemperature, suggesting that only dynamic interactions exist with the protein. Animportant result from this crystallographic study at 100 K is the appearance ofsome bound ordered lipid along the walls of the binding cavity. The preciseidentification of the lipid type is difficult because of discontinuities in theelectron density. Nonetheless, the conformations of 7 phospholipids and 43segments of hydrocarbon chains greater than 5 atoms in length have beendiscovered. The conformations of the bound lipid and the interactions betweenprotein and lipid provide insights into the factors governing lipoproteinformation.